As if the fire we were fleeing was not enough of a reminder of the fragility and temporary nature of all things (see our Smoke Over Wabakimi post about paddling past the Wabakimi fires of 2011), we spent our last day on Whitewater Lake at two sites that are in a state of abandonment and decay. It was sad to walk around and realize that if action isn’t taken soon, it will be too late. It seems such a waste of something special. The fatalistic take on it all, I suppose, is summed up in the line from the George Harrison song – “all things must pass away”. Or as the writer of the Book of Ecclesiastes put it more than two millennia ago- “There is a time for everything under heaven …a time to be born and a time to die.” There’s nothing we can do to escape the essential impermanence of all that is. In the case of the Ogoki Lodge site, you wonder how the owner(s) could just let it go like that. As is usually the case, lack of money is probably the explanation. Maybe the whole thing was a crazy idea to begin with. 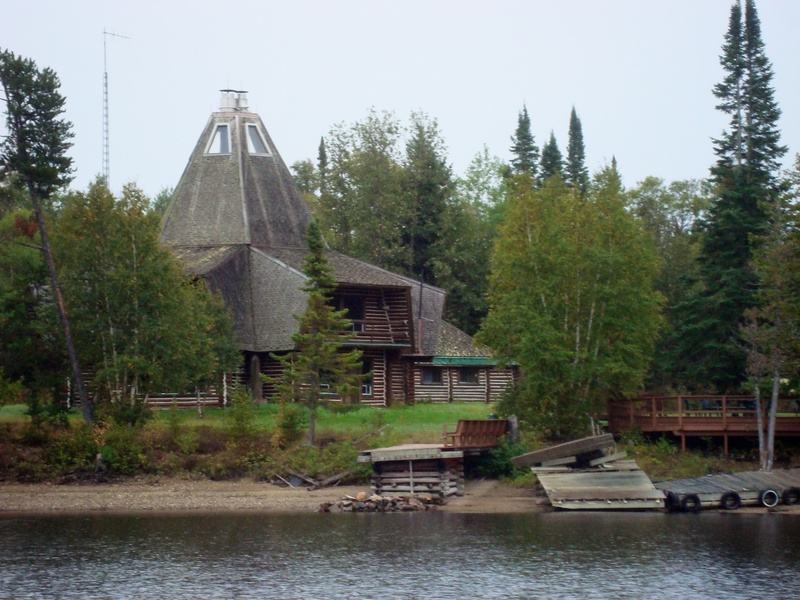 The Lodge, originally owned and run by members of the local indigenous community at Collins, was meant to provide ongoing work for local Ojibwe and Cree by attracting guests – most often that meant Americans – who would be flown in for a week of superb fishing on Whitewater Lake. Not clear is how many of the lodges and outposts indicated on the map above were open in the 1970’s; the more there were, the more competition for paying guests. The teepee-like main lodge is still in pretty good shape and seemed to be inhabited when we were there in 2012. Some locals I talked to attribute the teepee design of the structure to Wendell Beckwith, the hermit of nearby Best Island. 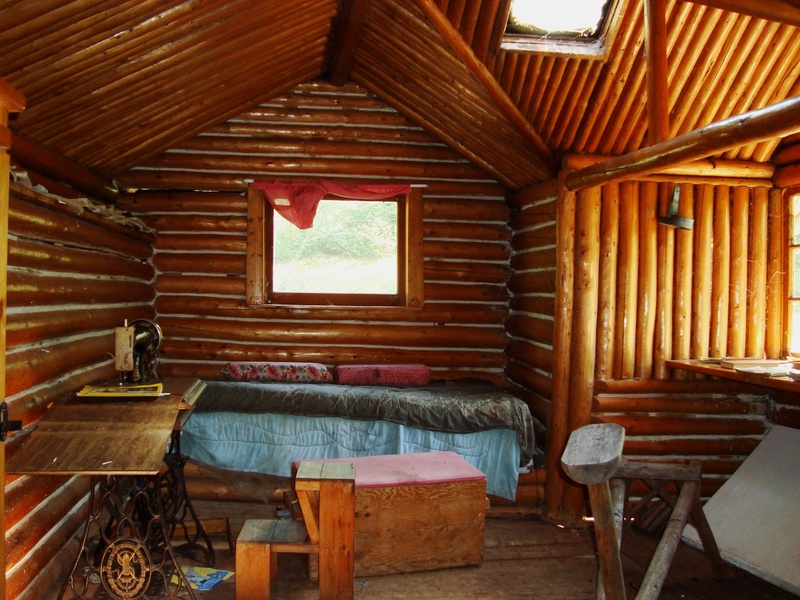 Apparently, he originally envisioned varnished moose hides to cover it but when that didn’t work out he suggested the more conventional cedar shingles. Correspondence I’ve received from Sheldon Rosen tells me that the design was actually the work of his Toronto architectural firm, then known as Group 33. In particular, Rosen noted the design contribution of Eneri Taul, the Toronto-based but Estonian-born architect in charge of the project. Also mentioned were the project engineer Roger Bayley and his younger brother Tim, who took his place on-site. The workers came mostly from the non-reserve status community of Collins, as well as from Armstrong Station, Mud River, and Ferland. (See the above map for locations.) Many brought their families along to Whitewater Lake where they set up camp near the work site. Local materials – logs, stone, sand – formed the bulk of the construction materials and the rest was either flown in or hauled over winter roads from Armstrong Station, a stop on the CN rail line indicated above. Near the central lodge are the five-sided guest cabins, two of which are visible in the satellite image above. The newest part of the site, probably dating to the late 1980’s or early 1990’s, is a two-storey motel-like structure with 10 guest rooms on each floor. It is the rectangular building with the green roof located on the point. The doors of many of the units are open and windows are broken; it is well on the way to becoming unsalvageable. According to a book by Edward Hedican, The Ogoki River Guides: Emergent Leadership Among the Northern Ojibwa, the original motivation for the Ogoki Lodge project came from the three Patience brothers (identified in the 1986 book as the McTavish Bros. to preserve their privacy). They were the sons of a Scottish HBC post manager at Fort Hope and an Anishinaabe mother whose father was a chief and one of the signatories of Treaty No. 9. The Patience brothers hoped to use the construction of the Ogoki Lodge and then its running as a way to provide the people of nearby Collins with employment opportunities, as well as a chance to learn new work skills, both in construction and the tourism industries. The work on the site began in May of 1974 and was funded by the provincial government of Ontario, although the Anishinaabe of Collins – and in particular, the Patience brothers and their Ogoki River Guides Limited – seemed to call a lot of the shots. Funding added up to a bit over $1,000,000., a sizeable sum of money in the 1970’s. 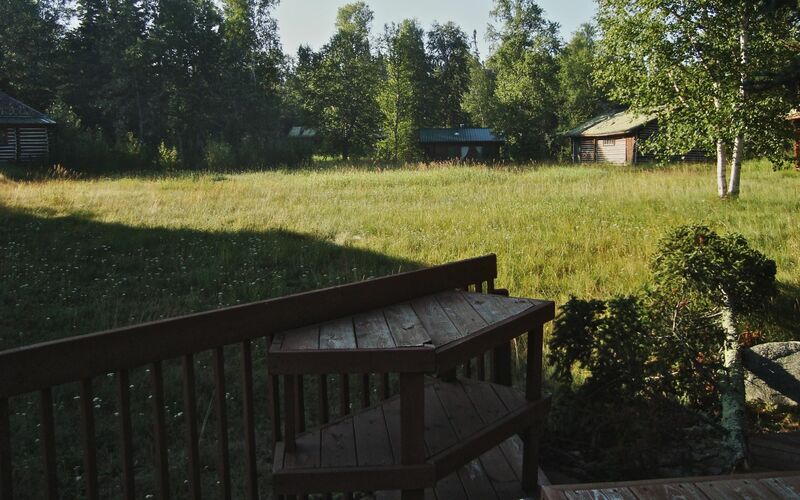 The Hedican book mentioned above states that once in operation after a shaky beginning, the lodge managed to come close to breaking even, although occupancy rates hovered around 40%. Given Joe Warpeha’s comments below, this must be around the time when his father stepped in and bought the property and then hired Bill Ferring as the operator. Joe writes that his father sold the property about fifteen years ago (i.e. late 1990’s). Still unclear is who bought the property in the late 1990’s. Perhaps one day someone will write the definitive Wikipedia entry on Ogoki Lodge. 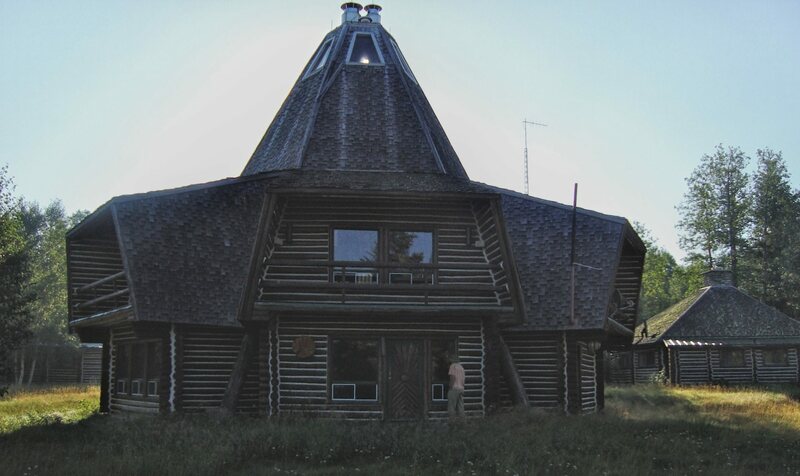 If so, it will join the entry on Minaki Lodge, still the ultimate grandiose northwestern Ontario lodge project. It was located some 400 kilometers west of Whitewater Lake but had the advantage of being right by the CN rail line. The Ogoki Lodge, on the other hand, is sixty kilometers from the rail line and requires a bush plane ride – or three days of paddling and portaging – to get to! The Minaki Lodge finally met its end with a fire which destroyed the main building in 2003. (For a satellite view, see here to download the kml file which will open in your Google Earth app.) It would seem the fate of the Ogoki Lodge complex is to fade away less dramatically. In June of 2017 VE3FAL1_Fred uploaded a video of the visit his paddling crew paid to the Ogoki Lodge and posted some video. The part from 2:30 to 16:30 takes the viewer on a ramble around the property. The Beckwith Cabins are in even worse shape than Ogoki Lodge. One building had a large hole in the roof which will allow the rains and snow to do their work even faster. Here is a property that could play a key part in the Wabakimi Provincial Park “story”, a hook other than fishing to sell a visit to the park. We felt like pilgrims at a shrine as we walked around the site but, in the end, we realized that we were two of maybe 50 people who would visit Beckwith’s Center of the Universe that summer. Wendell King Beckwith (born 9 Sept. 1915 at Whitewater Wisc., died August 1980 at Whitewater Lake, Ont.) was the son of Raymond Beckwith and Laura Imogene King. His father was a design engineer and inventor. Wendell had a high-school education and attended the University of Alabama (Botany) for one year only. His knowledge of engineering and science was to a large extent self-taught. He worked for a time as a draughtsman and, in the late 1930s to the 1950s, as a research engineer for the Milwaukee Electric Tool Co. as chief development engineer and/or vice president where he designed and patented for the company several pieces of equipment. In ca.1945 he left to set up his own development lab in Whitewater, Wisc., and also worked until 1955 as a freelance consultant with Parker Pen, one of his major clients. He did not invent the ball-point pen as is sometimes suggested, but received four patents covering writing apparatus and machinery. In ca.1955-56 Beckwith left his job, wife (Betty Mobert) and family (five children: Wendell Jr., David J., Laura, Imogene and Kathleen, who later married Harry Worth) probably due to his desire to do “pure research” into gravitation and radiation. In 1957-1958 he was known to be working for the Gravity Institute in New Boston analyzing submissions for funding. 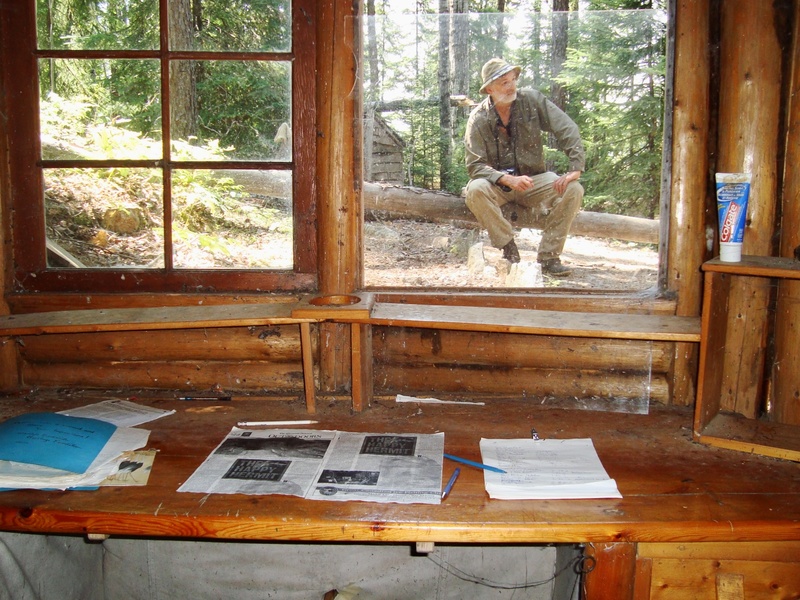 By the late 1950s, however, he was searching for a place of solitude in which to conduct his research. After spending three years at various locations in Northern Wisconsin he moved, in 1961, to Best Island on Whitewater Lake in Ontario. There, with funding from Mr. Harry Wirth, an unrelated American businessman, a cottage was built and Beckwith began his research. Until 1969 he wintered in Wisconsin and spent the rest of each year at the cottage. From 1969 onwards he stayed at Whitewater Lake year round and received frequent visits from friends, members of the group “Outward Bound”, and the local Native people. From Feb. 1971 to 1980 his friend Rose Chaltry of Minneapolis lived with him during the summer months. In the mid 1970s, Beckwith’s funding agreement with Wirth broke down after which he relied on friends, family and Rose Chaltry for supplies. Beckwith’s status in Canada was that of an illegal alien until 1974. He refused to apply for landed immigrant status, declaring himself a “citizen of the world”. Because of his “great assistance to the Indian population of the area” he was granted ministerial permission to stay. His refusal to apply for a land use permit, until 1977, led to protracted negotiations with the Ministry of Natural Resources. His research was done mainly in the winter. He would sit down before a blank sheet of paper each day and work on whatever topic interested him. The sheets he’d put into binders or folders. He took constant astronomical and meteorological observations. He formalized an agreement with the Ontario government in September 1979 whereby he bequeathed his research notes, papers and experimental apparatus to the people of Ontario on his death. Someone will ask -” Is it worth spending a million dollars in renovations and restoration so that fifty paddlers and fishermen a year can see some eccentric American inventor’s wilderness retreat on an island in the middle of nowhere?” Park officials are undoubtedly aware of the state of the cabins and in their inaction, they have given their response. Click on the book title above and you can access the entire chapter (pp.41-47) at the Google Books site. 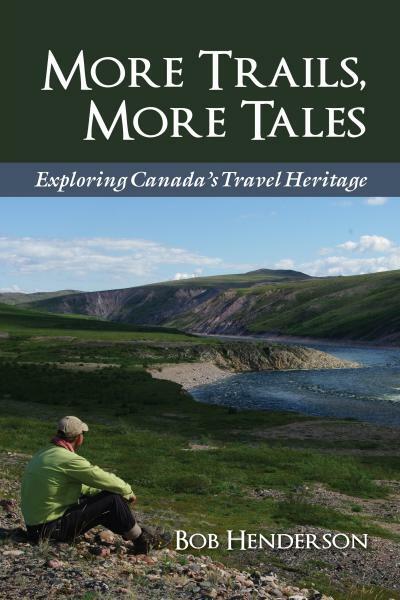 Or you can buy the book at the Dundurn Press website here – it is available as a digital download as well as in print. 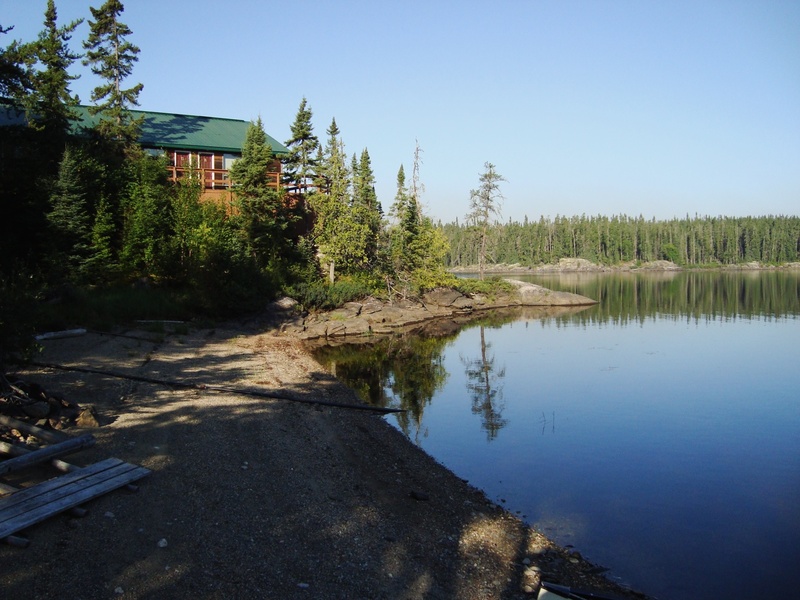 The time we spent at the Beckwith cabins there was one of the highlights of our Wabakimi canoe trip that summer. 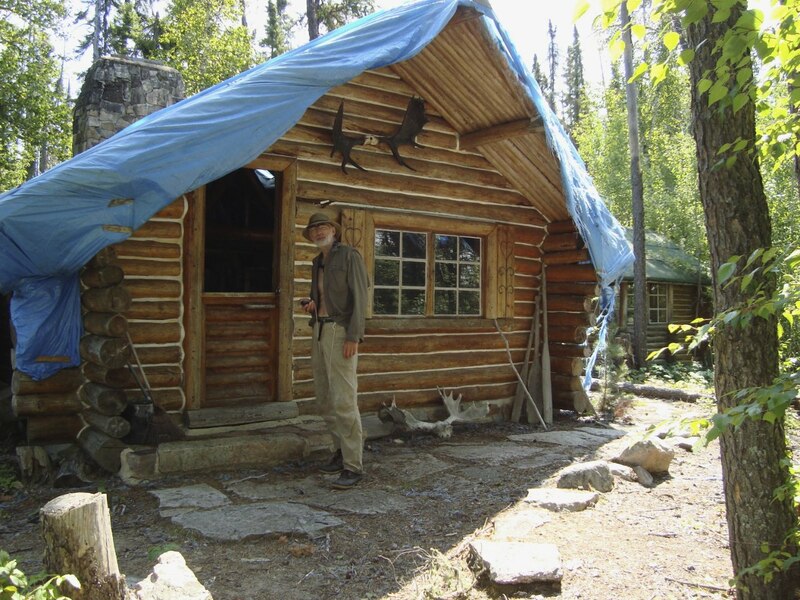 There is an interesting thread at the canoeing forum Canadian Canoe Routes about the Beckwith Cabins from 2008 that you might want to check out for more information. It was started by Kevin Callan to bring attention to his Youtube videos on Wabakimi and drew thought-provoking responses from a number of other posters, including a friend of Beckwith’s. It can be found here. If anything, the situation is that much more dire four years later. If you want to see what the Beckwith Cabins looked like in 1993 when Callan visited, check out his Youtube video. The last minute and a half of the canoe “epic” River Rat (click on the title to access) shows a site in much better shape than now. 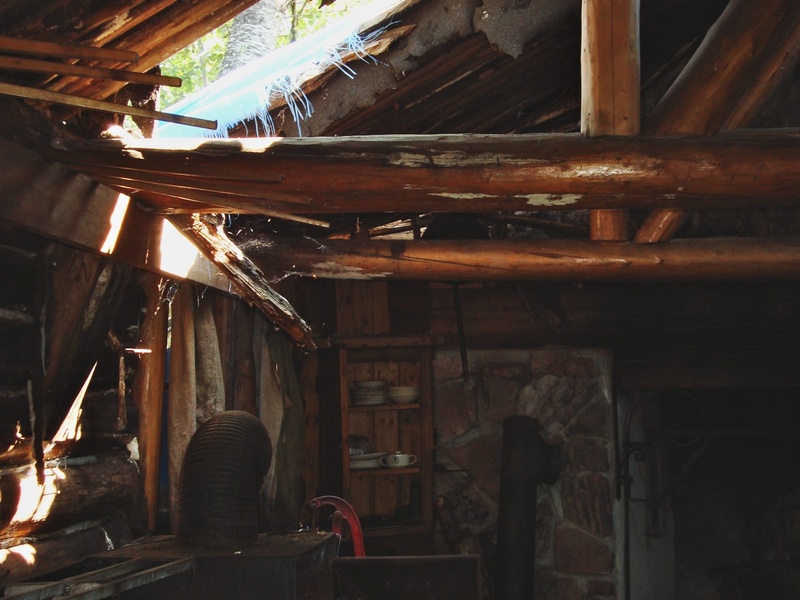 It was around 2005 that those trees came smashing down on the roof of one of the cabins. Sometimes you just have to shake your head at the way things play out. 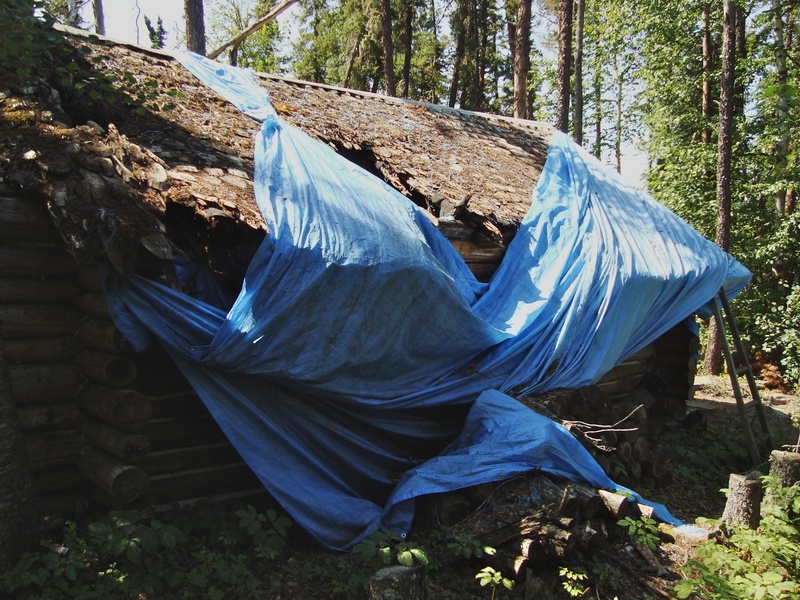 In 2011 Dan Rachor uploaded to Youtube a series of four videos on his just-completed Wabakimi canoe trip; Episode Four shows you inside of the three cabins. You can see the video here. 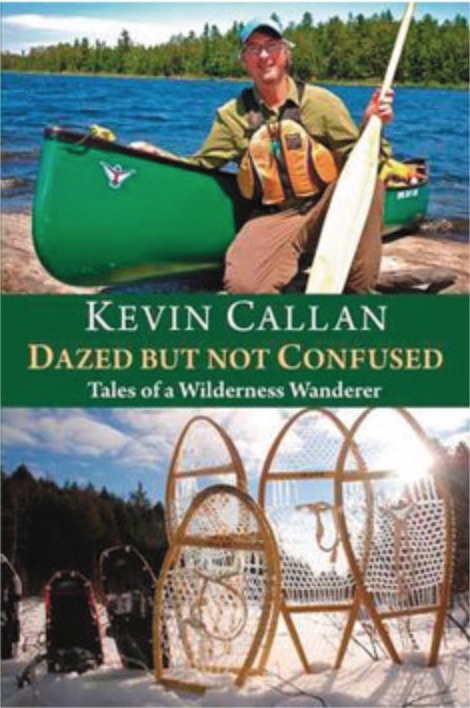 In 2013 Callan’s Dazed But Not Confused: Tales Of A Wilderness Wanderer was published. Billed as “a collection of stories” it consists of forty-one short chapters and it is clear that Callan has quite the collection of tales to draw from. 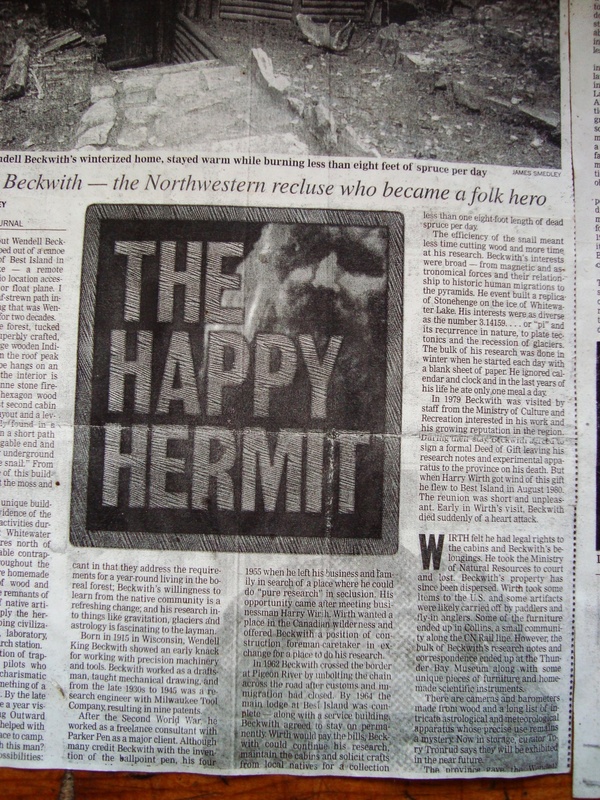 A couple of pages of chapter 36, titled “Hermits of the North”, has him turning to the Wendell Beckwith story one more time with an endearing portrait of the eccentric resident of Best Island. Click here for the Google eBook version of the book or on the title above for the Amazon link. 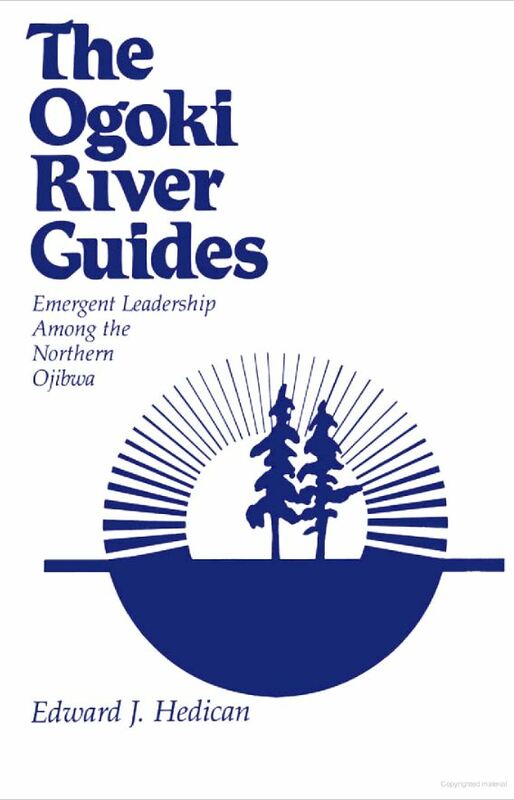 The Google Book archives has a few pages of The Ogoki River Guides: Emergent Leadership Among the Northern Ojibwa written by Edward Hedican and published in 1986. Hedican is currently (2013) a professor in the Sociology and Anthropology Department at the University of Guelph. 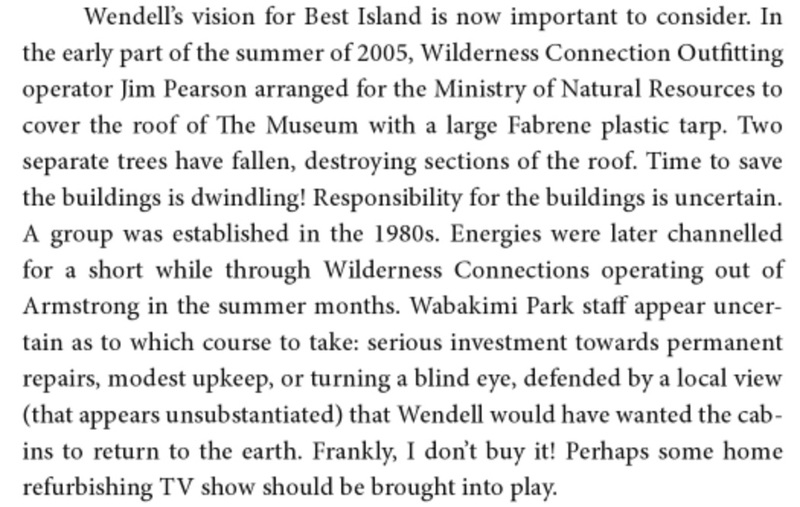 Most of chapter 5 – “ORG and the Whitewater Project” – is accessible and makes for interesting reading. (Scroll down to page 109.) It discusses the construction of the Ogoki Lodge, focussing primarily on the tensions in the relationship between the engineers and the Anishinaabe men working on the project. You can read it here. The entire book is available as a Google download for $18.62; given that there is a copy available for in-library use, I made my way to Toronto’s Central Reference Library and read it there. The book is also still available from the Wilfred Laurier Press. 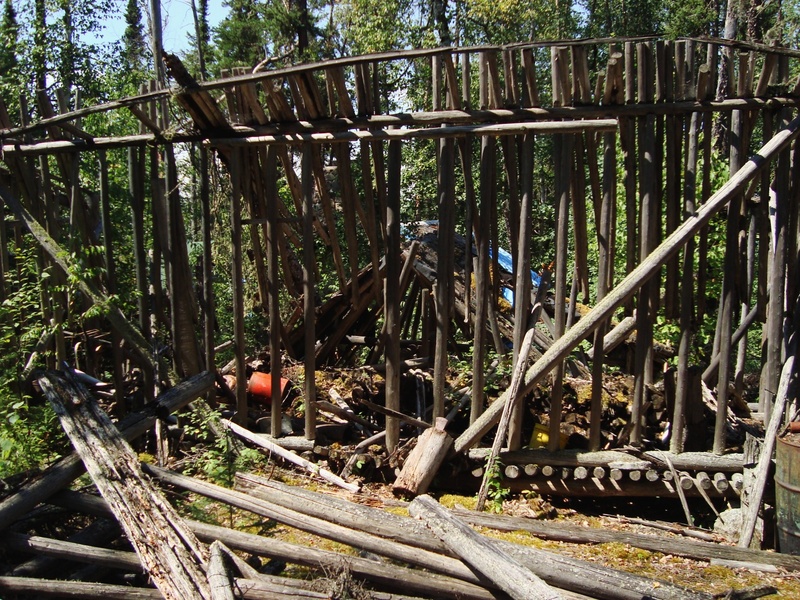 This entry was posted in wilderness canoe tripping and tagged Beckwith Cabins, Beckwith cabins collapse, Beckwith Whitewater Lake, Best Island, Ogoki Lodge, Ogoki Lodge Whitewater Lake, Wendell Beckwith, Whitewater Lake canoeing, Whitewater Lake Wabakimi. Bookmark the permalink. I KNEW WENDELL BECKWITH. MY UNCLE LYNN MARSHALL WAS BEST FRIENDS WITH WENDELL. THEY GREW UP TOGETHER IN WHITEWATER, WISC. LYNN DIED IN 1983. WENDELL WAS A MULTI-FACETED CHARACTER. I FISHED WITH HIM MANY TIMES IN WISCONSIN [CABLE] AND ONTARIO [GRAYSON LAKE AND WHITEWATER LAKE]. WENDELL, OF COURSE, DIED IN 1980 AT THE AGE OF 65. I AM PRIVILEGED TO HAVE KNOWN HIM. MAY HE REST IN PEACE! Michael, as I mentioned above, we felt like pilgrims as we walked around Wendell’s corner of Best Island and took in the details of the structures he built. I had wondered about the name of the lake; your information clears it up! 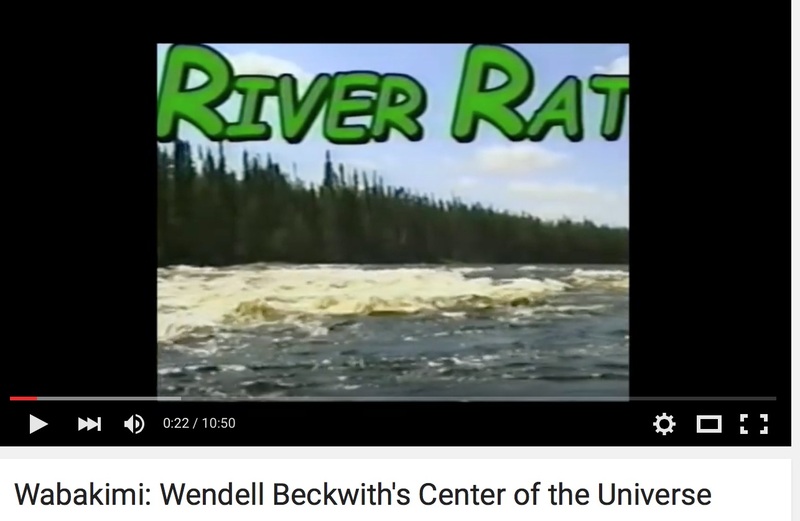 Maybe some day people will refer to Beckwith Island in Whitewater Lake! Thanks for sharing your memories of a fascinating man. Ogoki Lodge was a ‘make work’ project for the First Nations residents of the Whitewater/Armstrong area. 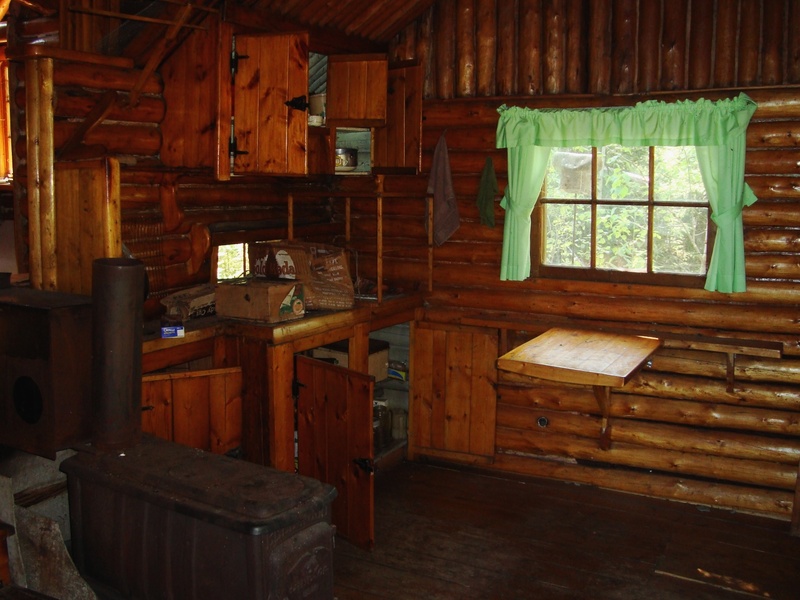 Millions of dollars went into the building of the lodge and its additional cabins. When the First Nations folks ran into trouble running the camp, it ended up in private operator’s hands for several years. I agree with you with respect to the abandonment of the Lodge. It is a unique and interesting structure that incorporates many of Beckwith’s designs. I was there only once many, many years ago when the Ferrings operated the Lodge. I was also lucky enough to see the Beckwith cabins at the same time. As a tourist operator myself, I deplore the deterioration of such beautiful buildings. However, at the present time, I doubt that the Lodge can earn its way, as so many of us are struggling to stay in business. It is a shame, though, that this place is dying, and that so many of taxpayer dollars have been wasted. As you say, it was probably a tremendous folly in the first place. Lord knows it was not the best of locations for float planes to arrive and depart. Perhaps the media will someday find this story and inform the good citizens of Canada that this lodge is sitting and rotting. Fran, thanks for the extra information on the Ogoki Lodge. From your comments I can see there is a real story to be told- perhaps not politically correct- and unfortunately not even surprising- but still needing to be heard. In retrospect, I wish we had come away with a better visual record of the state of the Ogoki Lodge site. 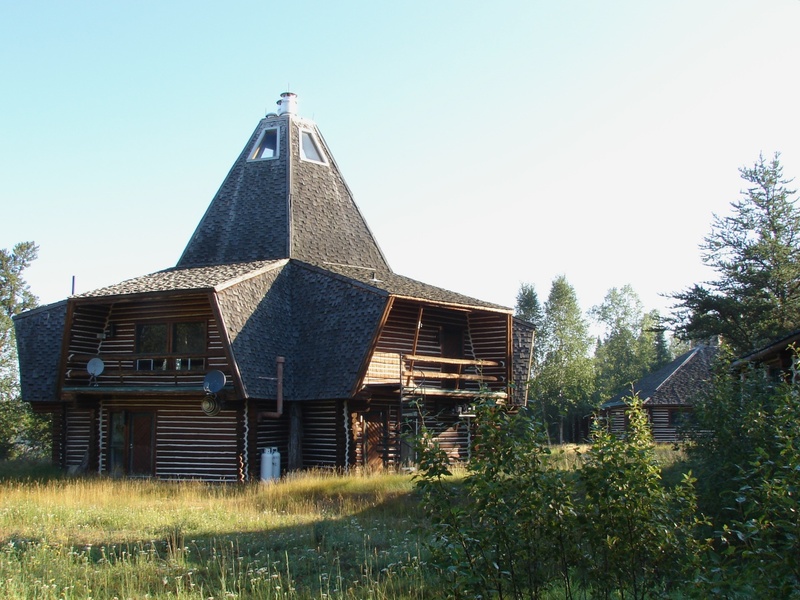 Our visit to Ogoki Lodge was the second in twelve months and it was deserted both times. It was fascinating for me to see those pictures. I was there – I am guessing late October 1979 or 1980 – filming a documentary called In Search Of Paradise. We were doing an episode about The Bush Garden, from Northrop Frye’s essays of the same name. We stayed at the Ogoki Lodge and had a team of local first nation guides with us for a few weeks. I remember a trip to the Beckwith cabin. I believe he had just died when we were there because the place was immaculate. It was quite fascinating. I cannot remember whether or not we filmed at the cabins. The show was made for TVO and the BBC. There must be a copy in the archives at TVO. It would be interesting to see what it looked like back then. 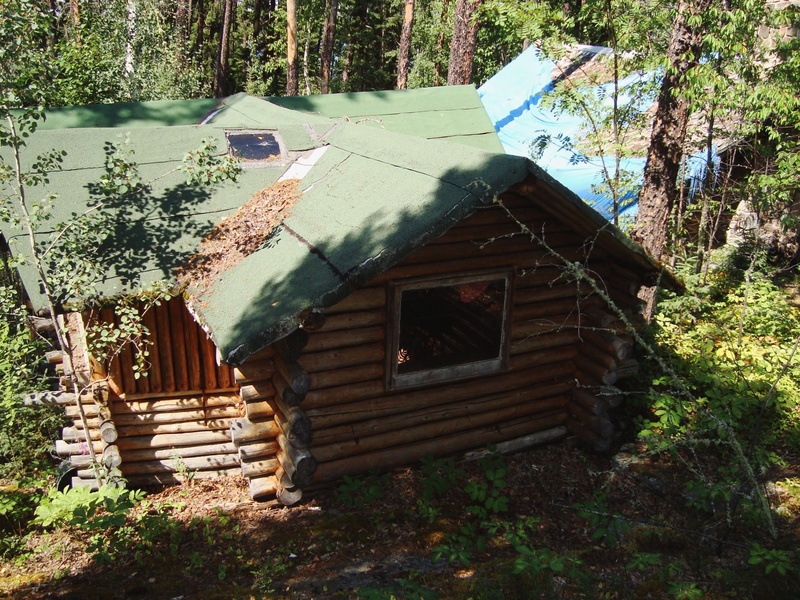 It is a terrible shame that both the lodge and the cabins are falling to bits. It is all so beautiful and hauntingly remote. My father was the majority owner of Ogoki Lodge in the early years. It must have been about 15 years ago that he sold it. As was mentioned above, Bill Ferring was the operator. He was a second-generation outfitter in the Armstrong area and was probably best known for Camp Caribou (on Caribou Lake just outside of Armstrong) and the dozens of outpost camps that he or his father owned going back to the 1950s and 60s. I think the elder Ferring was one of the first outfitters in that part of Ontario; he passed away years ago and it is my understanding that the younger Ferring has retired from the outfitting business. Bill Ferring is also a very experienced bush pilot (I always felt calm when he was flying the plane). I have many memories of Ogoki Lodge, Whitewater Lake, and Best Island as our family spent several weeks every summer for many years up there. I visited Wendell Beckwith’s place dozens of times and it never got old. As was mentioned above, the story goes (as I heard it told) that Beckwith believed Best Island was the center of the universe. Maybe that is the true story and maybe it’s not but one thing seems apparent: he was a recluse and he built an amazing and beautiful complex on Best Island. I fear that it will eventually deteriorate into something unrecognizable from what it once was. 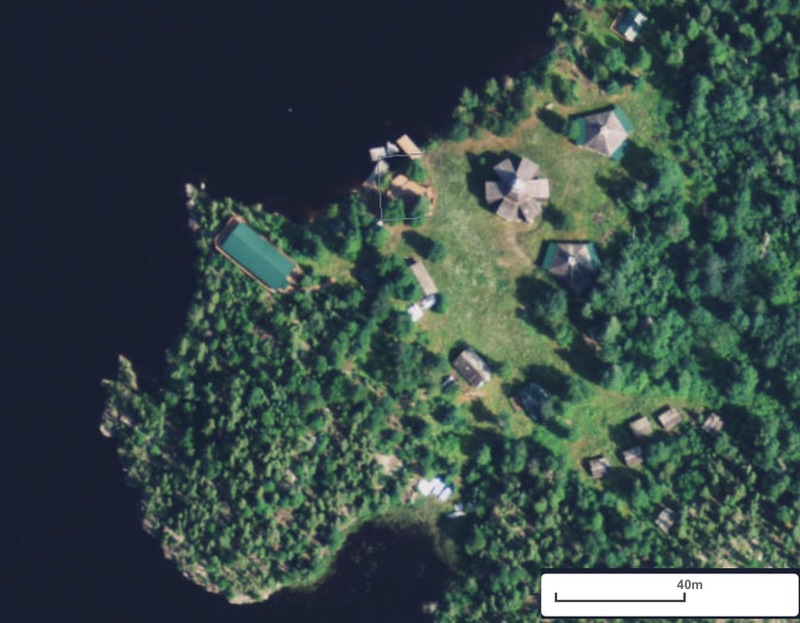 Ogoki Lodge was never a moneymaker, despite being on a large and productive fishing lake that is part of one of the most storied river systems in that part of Ontario. 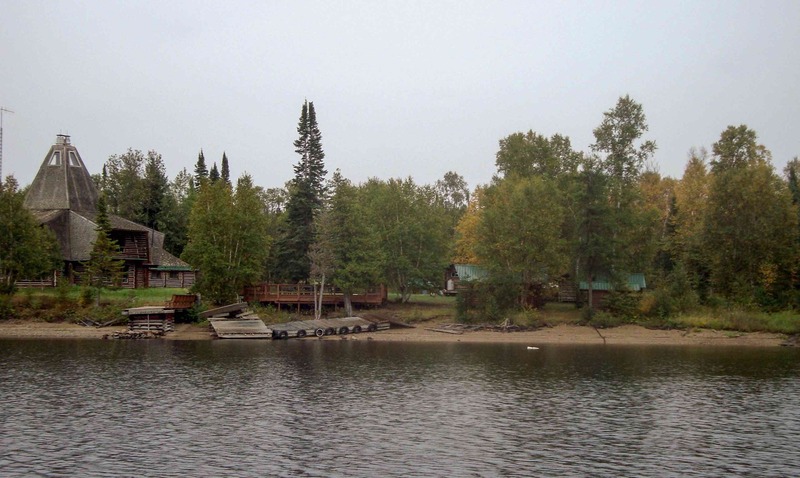 At one time, there were 4 lodges/outpost camps on the lake: one where the Ogoki River comes into Whitewater Lake (west end), one where the river leaves (east end), one south of Best Island, and the Ogoki Lodge. Of the four, the only one I know (for certain) that is still operating is the one south of Best Island. It is run by Don and Annette Elliot who own Mattice Lake Outfitters – you will not find two nicer people or a better run outfitting business. Despite having 4 lodges/outpost camps, the lake seemed big enough to handle the fishing pressure. I know who my father sold Ogoki Lodge to but I do not think the new owner put too many people in there. I am not sure who owns it now and, by the looks of your pictures, it has not been used in a long time. It was really a sight to see when it first opened up for business. When I was a boy, I remember touring the lodge and the grounds when my father was looking into purchasing it from the group that built it – that must have been in the mid- to late 1980s. I have heard stories about the current state of disrepair (there was also a fire sometime after my father sold it) but your pictures really tell a sad story. Joe, thanks for adding new information to my post by adding a little of what you know about these two places on Whitewater Lake. It sounds like you have more than a few childhood memories that go back to Ogoki Lodge and the summers you spent up there. Maybe you should start a blog which would expand on your “I sure could tell you some stories”! If not, feel free to add another comment or two here – I am sure that they would be read with interest. Hello, thanks for sharing your pictures and memories of Ogoki Lodge. My Dad and I ran it for one summer back in the early 80’s. I was about 9 years old and have some of the best memories of our time together there. My father’s name was Bernie Junior. Bernie was diabetic, however, and had forgotten to bring his insulin along. He was very stubborn and didn’t ask anyone to bring some and failed to mention it all together. Needless to say, he went into shock and had to be flown back (somewhere) to the nearest hospital where he was admitted. I stayed at a stranger’s house (I believe he was the float plane pilot and may have been affiliated with the lodge in some way but don’t recall). There was also a French cook named Muget (forgive my spelling of her name). I used to clean the fish for the guests and hang out with some of the native indian guides. When we were there it was fairly busy – it’s a shame to see it in the state it is now in. I have a few pictures I will try to dig up and post. Thanks for sharing! Jeff, nice to hear from you. I can see why Ogoki Lodge would stick in your memory, thanks to its connection to the time you spent there with your dad and the natural beauty of the place. Photos of the Lodge from back in the day would be great to see! Send me the link when you post them – or send them to me and I will include them in my post with a note on where they came from. I was visiting my daughter this weekend (she lives near Manchester, UK), and whilst there spotted a picture of us at Ogoki Lodge, taken in the summer of about 1989. So I just happened to google it and was led to your excellent blog. At that time the lodge was pristine and absolutely idyllic. We attended a board meeting of the Armstrong School Board, hosted by Peter Cheeseman of Armstrong, at the lodge. As I recall, Peter was an airplane engineer (I think perhaps he maintained the float planes). He also was a superb ambassador for the North, and was a good friend at the time. Peter was primarily estates manager for the board. When I get home I’ll look up some of the pictures taken on that trip. In particular I have one of our daughter aged about 7, with a 3lb walleye. Very fond memories of a beautiful location and very sad to hear of its decline. Pete, thanks for taking the time to comment and to provide another thread in the Ogoki story. It is a place that seems to have touched more than a few people. In spite of what time and neglect have done, I’m glad we got to paddle by and spend some time at the site. Have fun finding the right container with those pix in it! I visited Ogoki Lodge and the Beckwith cabins twice in the early 1990’s. 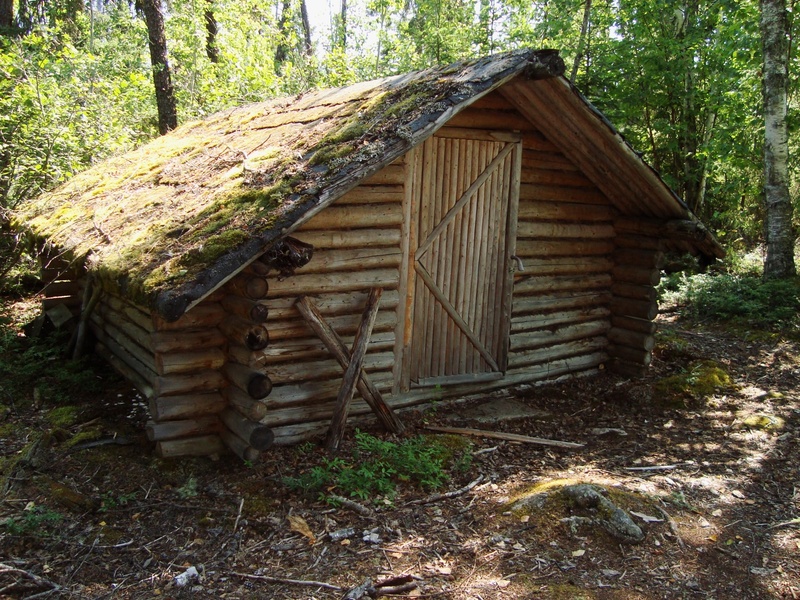 Only the main lodge and several cabins were there. The two story structure was not there. 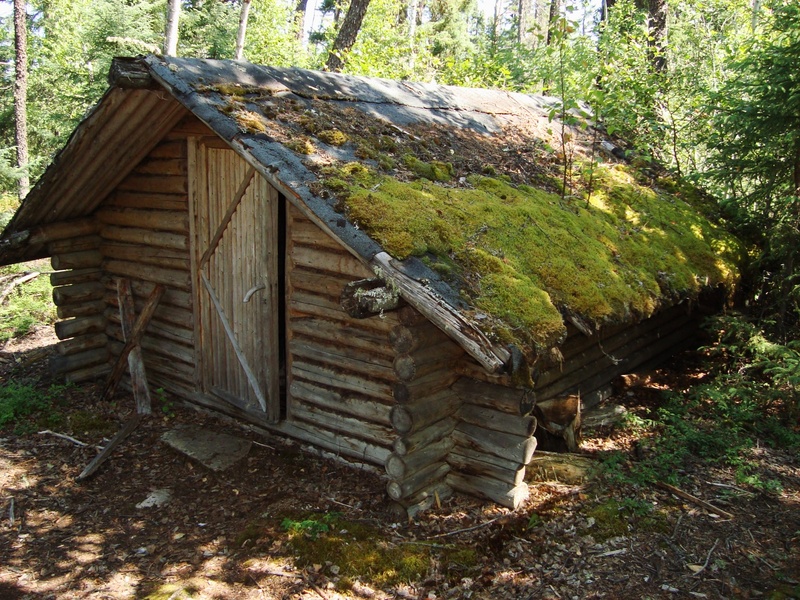 There were several cabins on Best island.Wendell had built one cabin above ground, one partially above ground and one in ground. He was experimenting with insulating factors I was told. He used a dumb waiter system to lower food items into cold storage. The site is supposedly exactly opposite 0 degree longitude and this was the reason Beckwith choose the site or at least that is the story I was given. Bob Izumi filmed an episode of his fishing show at the lodge. If I find my pictures I will see if I can figure out how to post them. Dave, I’ve been out travelling for the past month – Sri Lanka! – so I missed seeing your comment. Thanks for the additional info on the lodge and the cabins. Re: your pics. They would be great to see! You might do what I did – open up a free wordpress.com account and create a post to which you can upload the pix. I’d be happy to post the link in my write-up. Or if you’d like, you could email me the jpg files and i could add them to my post. It is a story that should be better known – and seen! The dumb waiter is still in working order. 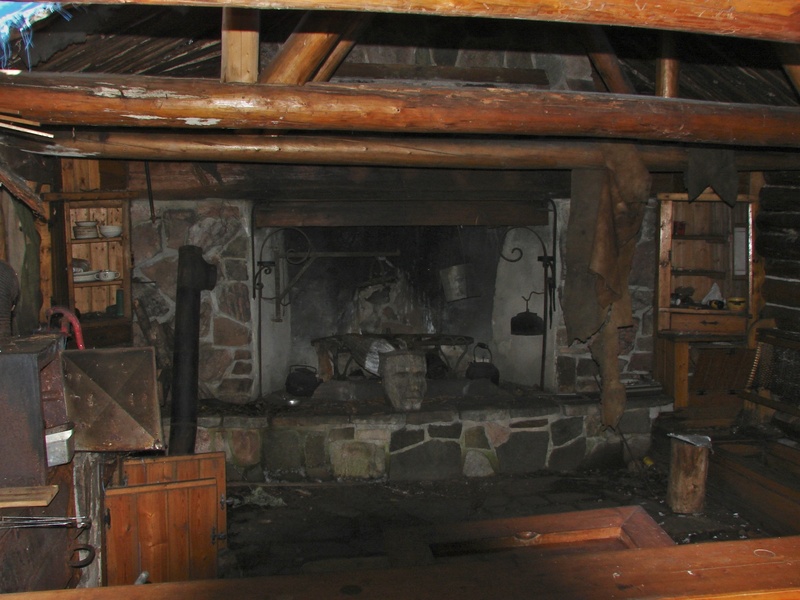 I was astounded by the ingenuity he put into things like door levers, all the storage and the work that went into the Chimney in the Museum as well as the draft fix he did for better circulation in the winter to stay warm and burn less wood. Fred, just looked at Days 1 and 2 of your Lasso Route! Great stuff – had me wishing I was out there again! i guess Day 3 will be on to the Berg and then down into Whitewater Lake and the Lodge and Cabins. I will check back in a few days after you’ve uploaded. Thanks for the link. Re: the dumb waiter. Looking around the place there is all sorts of evidence of his intelligence and cleverness. 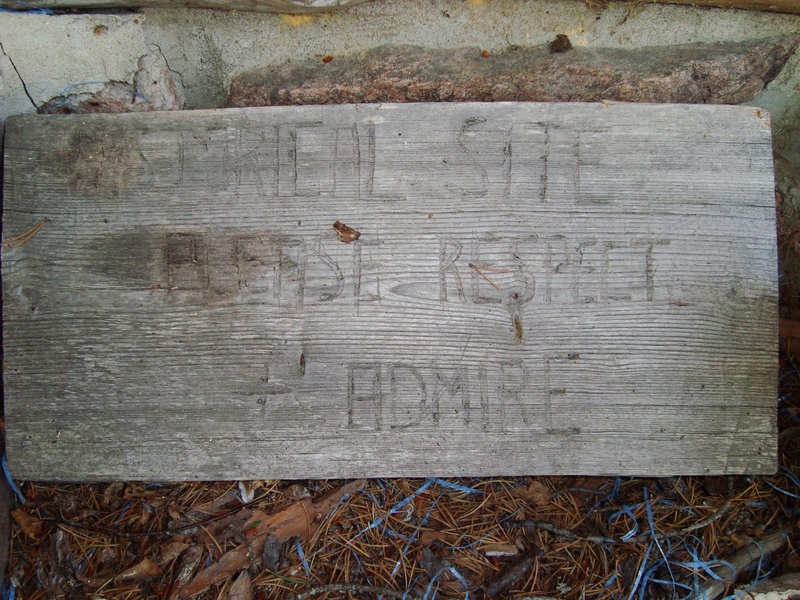 We saw Wendell’s cabins in 2011 at the end of August. It is a fascinating place and seems frozen in time. While I understand it would cost a lot to repair and maintain them, I wish they could stay intact. So much thought, ingenuity and artistry went into them. Along with the fires (!) seeing the cabins was one of the highlights of that summer’s trip. I wish that they could indeed be frozen in time – but the big hole in the roof of one of the cabins will ensure that things fall apart even faster. Having missed seeing them the previous summer, we were glad to have found them the second time – and a combo of awed/saddened as we walked around the site. 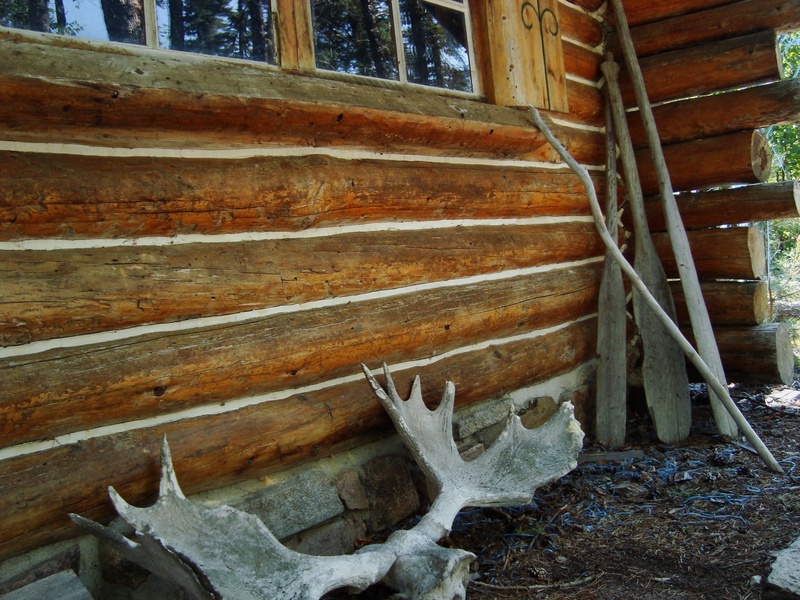 I stayed there with friends on an annual fishing trip with Wilderness North Outfitters back in the early 90’s. The lodge was impressive and beautiful. The fishing was good but not great. The Beckwith Cabins were amazing. Too bad they are all in disrepair, but I guess everything changes with time. It is a unique place and will always stand out in my mind as one of the most interesting places I have ever been. John, your take on the Lodge and the Cabins was the same as ours! 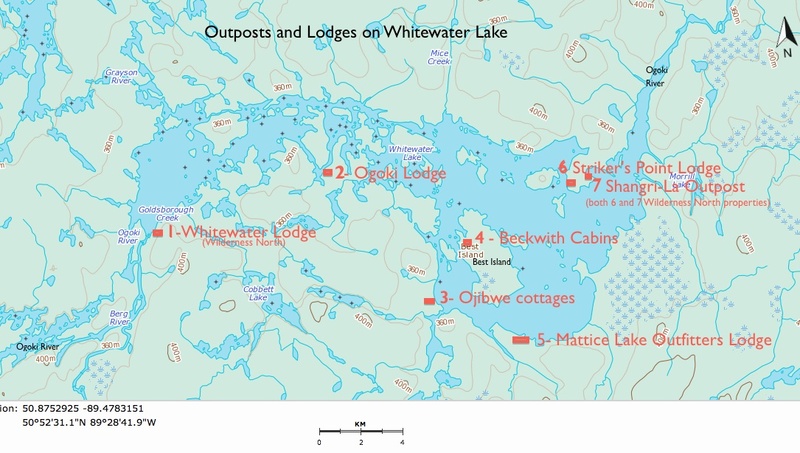 Wilderness North still has outposts and fishing lodges on Whitewater Lake but I don’t think the Ogoki Lodge is one of their properties – or if it ever was. One of the comments does make mention of a Wilderness Connection Outfitters. Different company or same company with different name? It may be that WNO had a special arrangement with the owners to have its clients stay there. From Joe Warphela’s comment up above, it sounds like his father would have been the majority owner back in the 1990’s. at Whitewater Lake built in 1974. In looking it up on the internet, I was astonished to see that virtually every word of the published articles was incorrect from names to attributions. Here are the correct facts. The project was originated by the Patience brothers, Don and Peter Patience. They were Ogoki River Indians and extremely well-informed individuals. The design was done by a Toronto-based architectural firm, Sheldon D. Rosen Architects who with their in -house engineering staff led by Roger Bayley actually managed the construction of the project on site. As many materials as possible were selected from the immediate surroundings so that all major structural and landscaping items were specified and supplied locally. Only the manufactured items such as windows, appliances and plumbing were either flown in, in Summer or sledded in when the Lakes froze over. Beckwith, as I recall, was introduced to us as a recluse who had fled the urban rat race and who lived at the opposite end of the lake in a very crude cabin hewn out of the woods and without any conveniences. He had nothing to do with the design or construction of the Ogoki Lodge. The original management we heard from time to time was in regular battles with the authorities as to the proper operation of the finished lodge. This was an instrumental fact leading to the eventual degradation of the wonderful original little complex. We would ask that you correct the written history of this wonderful little deep woods development whenever its story is further published or disseminated. Dear, Anon. I appreciate your input. The narrative I read in your comment certainly conflicts with the Edward Hedican account. You write – “…virtually every word of the published articles were incorrect from names to attributions” You’d have to wonder how not just Hedican but everyone else until the Sioux Lookout source told you his story could have gotten the story so wrong. Hedican, for example, was there in the local community at the time of the construction and his account was published a decade later as an anthropological study in 1986 – thirty years ago. I’ll reread the Hedican book – at least the parts that are available at Google Books. I’ll also try to get in touch with Professor Hedican as well as the architectural firm you mention to see what they say. 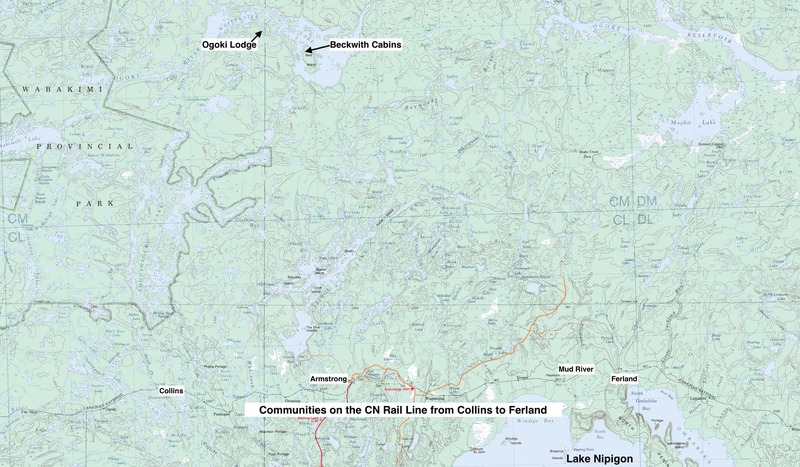 It would also be great to be able to communicate with the Sioux Lookout elder to see how he is connected to the construction and where his info comes from. Before you go to any trouble with your research, let me try to clarify my comments. It was not the Chief who brought up the subject but me. The chief was only vaguely aware of the site. I was the architect commissioned by the Federal Government to design the project. Roger Bayley was in my employ at the time and both he and his brother were instrumental in the construction of the project at the site. During the construction there were a few setbacks including the mysterious explosion that demolished the supply dock. If you learn more about the very beginnings of this project I will be more than happy to assist in clarifying the “truths”. It amazes me at the lack of information about this place, considering the Gov’t soaked a wad of cash into this just to see it left as it is. Fred, it feels weird to thank you for the bad news! Not that I am surprised. I almost hate to look at your video! It doesn’t have to be that way but – that’s the way it is. Does that sound fatalistic enough? I will put a link to – or embed – your video in my post when it’s ready and uploaded! Sheldon, I am assuming you are the Anonymous of the previous comment. I’d like to talk to you about the Ogoki Lodge story and the facts as you know them. I have not read my post in a couple of years so I am certainly not up on all the details. I’ll have to reread it and the Hedican book, my main source of information as I wrote the post. Thanks for contacting me. I’ll get in touch. I too would like to get some firm dates and information for my video before I post it but not sure that will happen. I will post some of the fragments that I have right now as a quick walk around the property and later post a more in-depth video of Ogoki as well as Beckwith’s place as it now sits in disarray. We just finished 10 days in the area last week and visited the lodge as well as spent two days at Best Island. The Lodge is a mess with mouse feces all over the place now and beams slowly collapsing. The septic filed tanks are all wide open and pose a danger. It is a shame to see this place left in the condition that it is in today with so much money still sitting there. 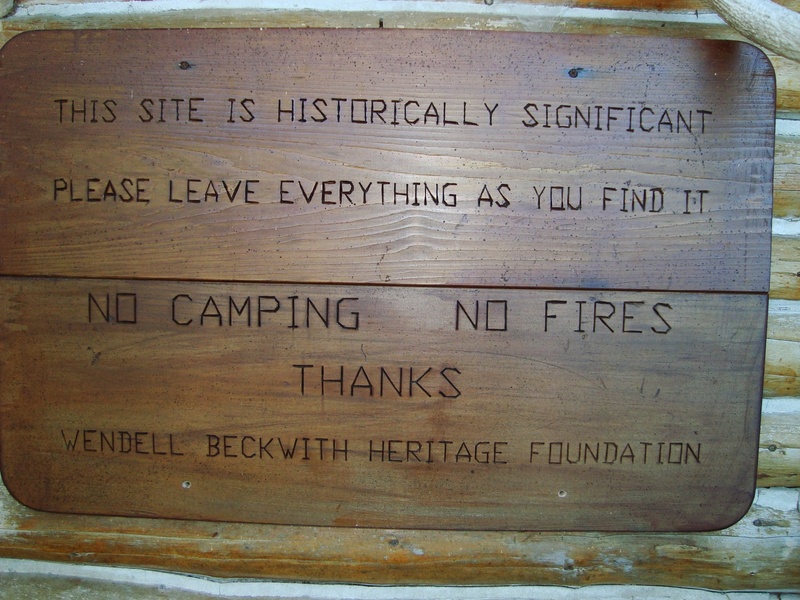 Best Island and Beckwith’s cabins have now collapsed even more since your visit and pictures. I will have video up on my YouTube Channel showing both.